For of you who don’t speak Portuguese (and let’s face it who does? ), Fogo de Chão literally translates into “fire of the ground.” More colloquially, it stands for “campfire” or the vertical fire pits that Brazilian gauchos have used to roast meats for hundreds of years. The pronunciation is something like: “fo-go d’chow” — spoken while zipping past the “da” like Emerson Fittipaldi at The Brickyard, and nasalizing the last “ow.” Trying saying it like this if you want to sound like a Brazilian. If you simply want to eat like one, you’ve come to the right place. 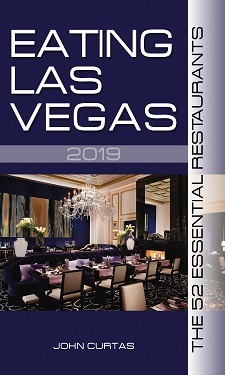 Las Vegas is now the home of the 18th Fogo de Chão in the United States, and it’s as formulaic as any chain, but that doesn’t mean the food is anything less than mighty fine. Every South American ELV knows — and that would be exactly four of them — gives it their unequivocal stamp of Brazilian/Argentine/Peruvian approval, and that’s good enough for us. And if you love meat in all its guises, it’ll be plenty good enough for you, too. Our personal guide for our recent dinner was Alvaro Dos Santos — Area Director of Las Vegas Premium Outlets, and a man who knows his Brazilian (as well as his Spanish, Italian, Swedish, Japanese, German and English). He guided us through the menu along with a slew of great looking passadores in gaucho garb — who provide as much eye candy for the ladies as they do meat for the men. Speaking of lethal, the pale, grey-green pepper sauce looks innocuous but packs a serious punch. Speaking of sauces, the mint jelly was standard issue, but we’re of the old school ilk just enough to even like mint jelly from a jar on our lamb. The fried bananas, strangely enough, go great with the meat, as do the finely fried polenta cakes, and the warm little cheese rolls that start the meal are so good you’ll be tempted to eat nothing but them. The chimchurri sauce wasn’t as chock full of herbs and garlic as Rincon Buenos Aires‘ version on the other side of town, but “…it’s Argentinian, but I still love it,” said De Santos, so we’ll give it a pass….and nevertheless found ourselves ladling it on whatever cuts weren’t flavorful enough to eat unadorned (of which there were few). A nice salad bar is also offered to get you started, but as above-average as it is, the mesquite-grilled meats are the real draw. Those cheese-crusted pork nuggets and the marinated lamb chops are worth a trip all by themselves, as are the Flinstonian beef ribs — rich, meaty and tender — and a far cry from the usual chewy Brontosaurus bones you get at other churrascarias around town. It is that cooking, and the quality (and authenticity) of the meats that separates FdC from it’s competitors. So sayeth our slew of South American friends and our staff…so we’ll let that be the last word on the subject. Prices are $26.50/person for lunch and $44.50/person for dinner, with a salad bar-only option of $19.50/$22.50 available. Children under 5 eat free, kiddies between 6-10 eat for half price, and anyone who asks for fish will most likely get ridden out the front door like a Brahma bull. So what youre saying is… there’s yet another Yolie’s/Pampas/TexasDeBrazil/Tucanos/ViaBrasil/Samba in town. Yippee??? I have the meat sweats just reading this. Looks tasty. To bad they continue the trend of gaucho-ing you on the wine prices. 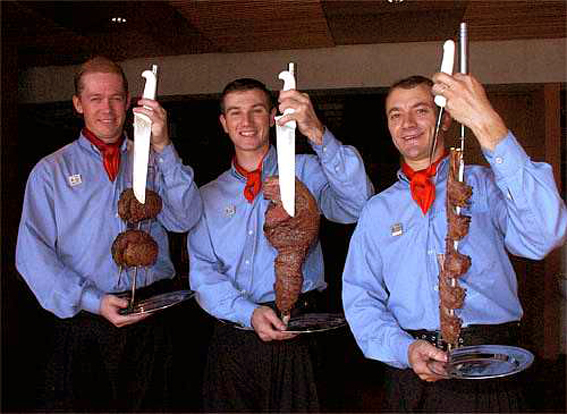 Fogo is the standard of the meat on sword industry. This is the way the other places wish they could do it.